The buzzing started a couple of days ago and I saw someone mention that the hummingbirds were back in Albert Park and I thought to myself “hey, I’ve never seen hummingbirds so that’d be pretty cool to check out.” Then realisation crashed over me in an awesome wave, the buzzing; that definitely wasn’t hummingbirds. 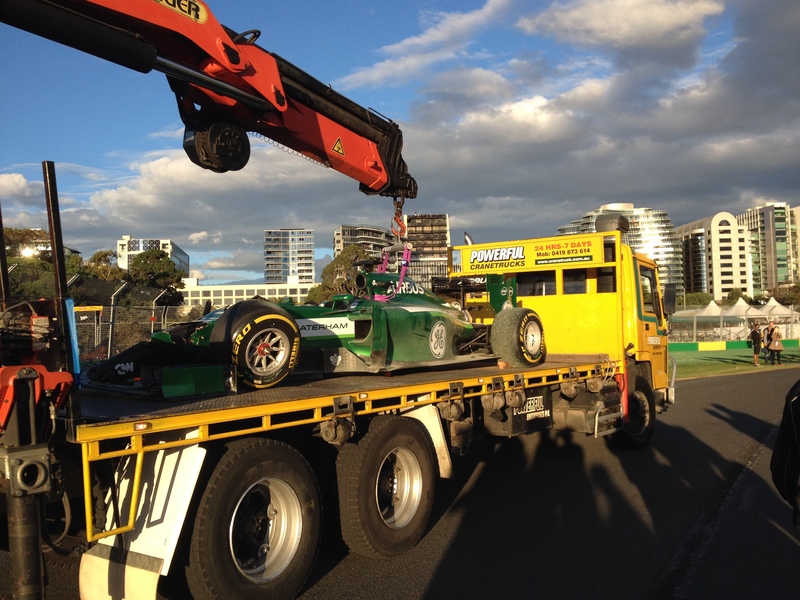 The Grand Prix had arrived in Melbourne. I’ve never really been a fan of racing, going round and round in circles doesn’t really appeal to me as a sport. However, I am a fan of new experiences so I figured that as the cars were in town it’d probably be worth my time to check it out. It certainly isn’t one of the more affordable events that come to town, with general admission for race day costing $100 but this is something I may only get the opportunity to do once, so I didn’t mind splashing out. 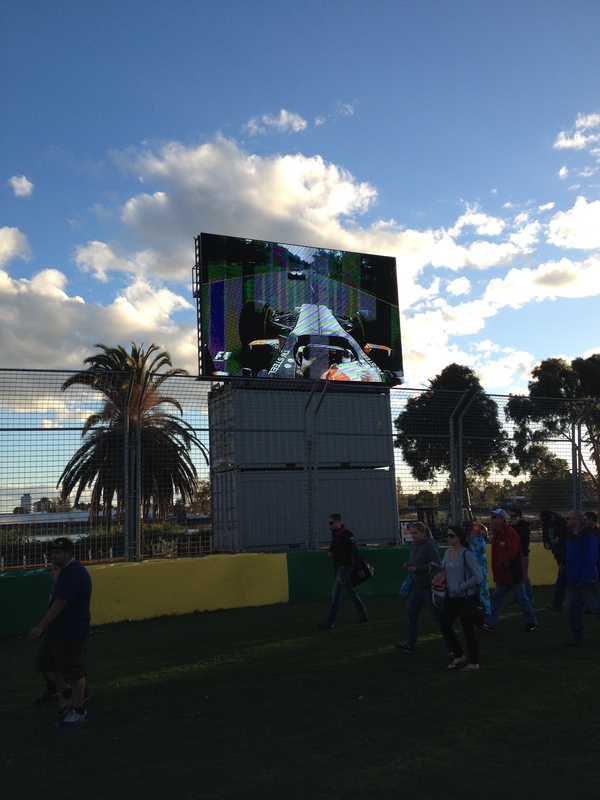 @Christoph_Orr @TCFMark "F1 is too political these days it should be all about the racing". @Christoph_Orr @TCFMark @davidjb1988 "I can't wait until they release the House Robots!" @Christoph_Orr @davidjb1988 Also, being in Australia, you must say very loudly that you think Daniel Ricciardo has no chance. I also had a read up on a couple of articles on the BBC so at least I would have some extremely limited idea of what was actually going on around me. I discovered that Mercedes are favourites for the season and Lewis Hamilton is expected to do well. Ferrari have put two “beasts” together with Fernando Alonso and Kimi Raikkonen in the same team which has apparently helped to build the excitement for the coming season. It also seems that there have been some rule or technology changes to make the sport more green but at the moment I feel the less I know about this the better! 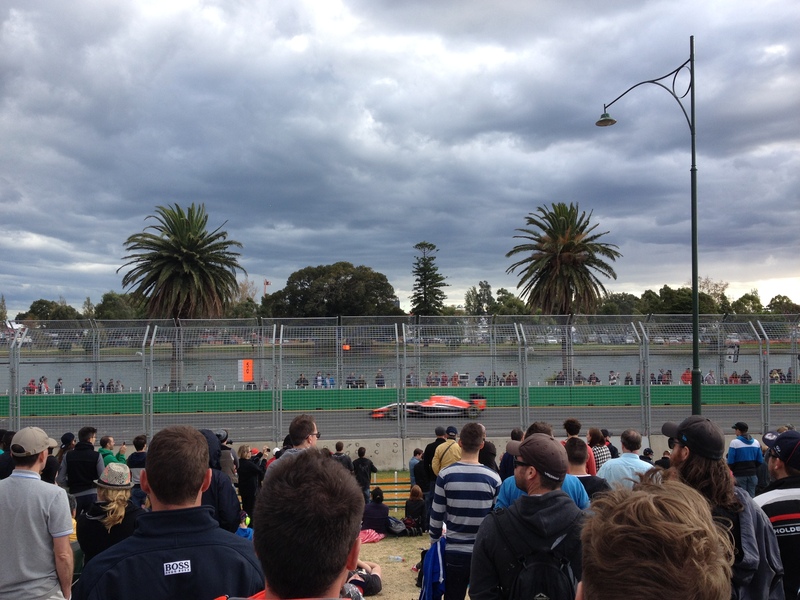 People started arriving at Albert Park as early as 9am to secure good views around the best parts of the track. 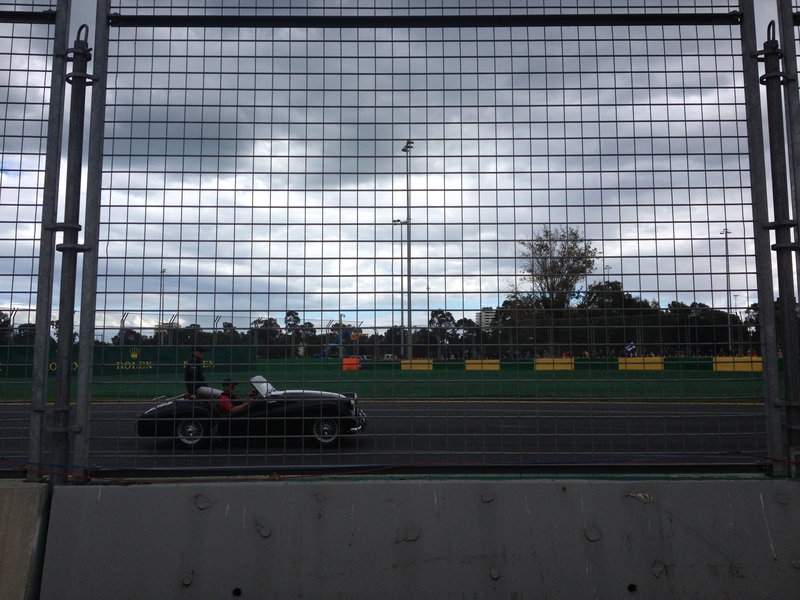 I didn’t rock up until much later and found that the Grand Prix is practically a festival of racing and cars. I reached the track during the last few laps of a race between reasonably fast and loud cars before I met up with Matt, Sarah and Matt’s sister Bex; all three had a much better idea of what was going on and were regularly plagued with my questions. 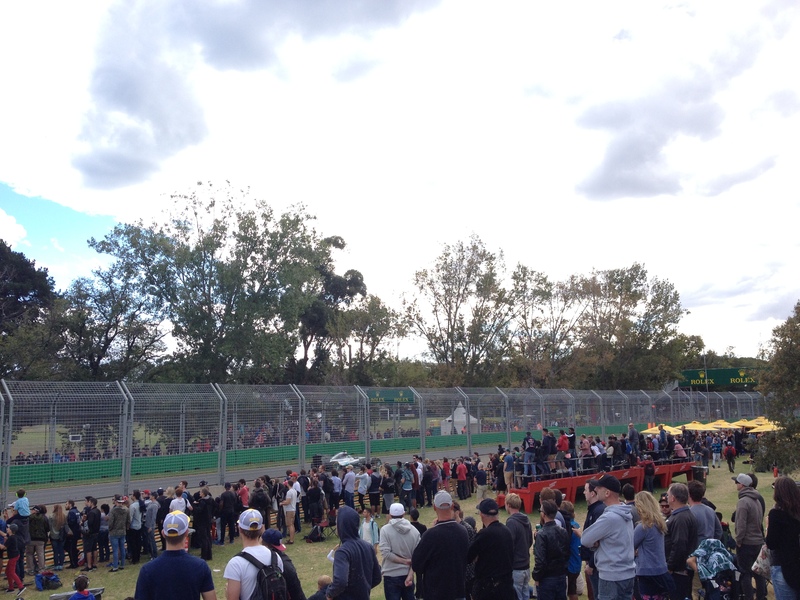 The main event gets underway with a driver’s parade as they get driven around the track; some happily waving to the adoring crowd, some taking selfies for their Instagram accounts and others looking genuinely displeased with having to endure the formalities. 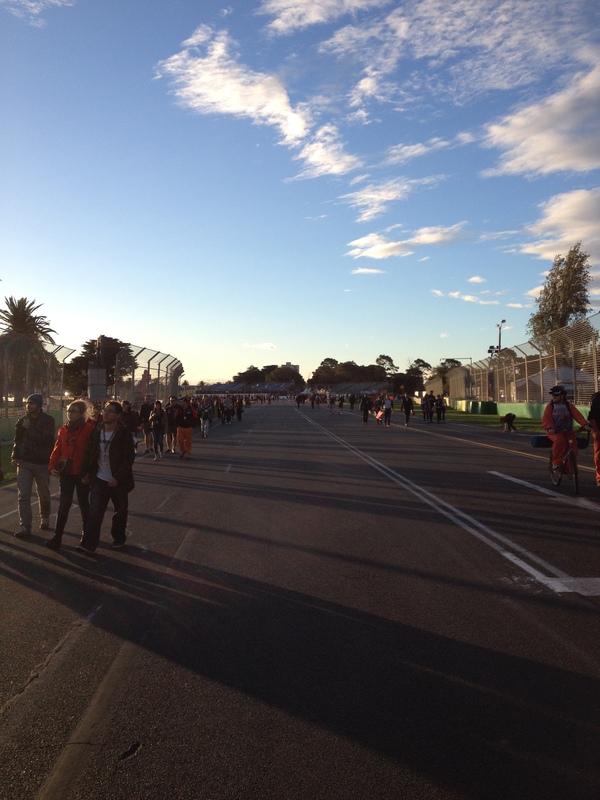 Not long after, we headed over to the first corner to watch the opening laps. Britain’s sweetheart Lewis Hamilton was leading the line with local hero Daniel Riccardo in second. Everyone seemed rather pleased that former world champion Sebastian Vettel hadn’t even got into the top ten. All the drama happened in the very early stages of the race, with Lewis Hamilton being forced to retire due to engine troubles with less than five laps done. This news was not well received by Matt who was hoping to see Hamilton take an early lead in the season. Not long after Vettel was also forced to retire and by the end of the race only 12 competitors posted a finishing time. With Hamilton out, we turned our attention to Jenson Button and Riccardo in the hope that we’d see high finishes from them both. 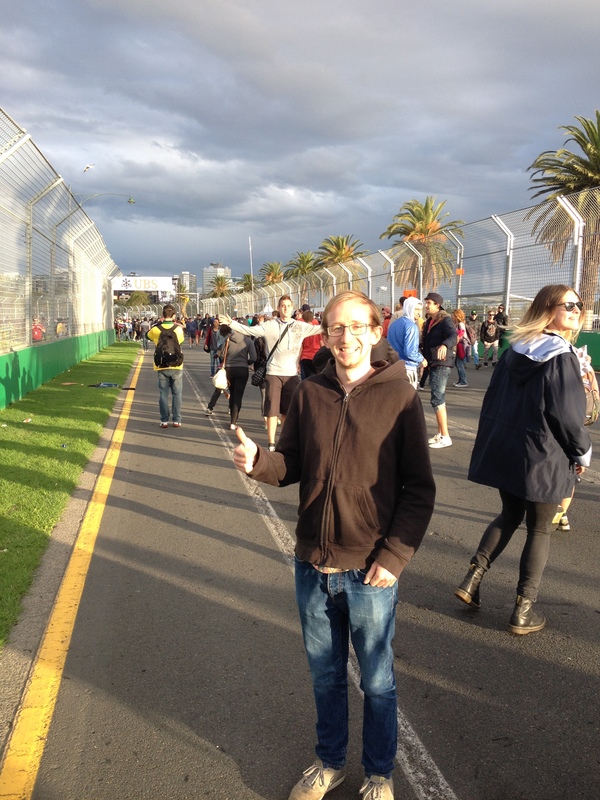 As somebody who doesn’t really understand Formula 1, I found that I was quite easily drawn into the hype surrounding the event. There is apparently plenty that can happen before during and after the race that can have lasting effects on the season which makes it a lot easier to find racing more interesting than simply cars repeatedly going around the same track. While there wasn’t much in the way of over-taking, it was quite cool just to watch the skill of the drivers as they, for the most part anyway, managed to control the powerful machines. Throughout the race Hamilton’s team-mate Nico Rosberg showed why Mercedes were pre-season favourites, pulling further and further ahead of the pack to win the race with close to 25 seconds to spare. However, the home crowd were still jubilant as Riccardo managed to hold on to second. Third place fell to Kevin Magnussen, the 19 year old rookie who was competing in the Forumla 1 for the first time. Jenson Button finished up in fourth, so despite our earlier disappointments the final standings turned out to be reasonably satisfactory. During writing, I’ve come to learn that Riccardo has actually been disqualifies due to a fuel flow infringement. I have literally no idea what this means and it makes Formula 1, as a sport, all the more confusing for me. There are clearly a lot of rules and regulations that I frankly don’t have the time for, but are obviously there to add twists and turns to the season’s narrative as it draws on. Apparently Riccardo’s team, Red Bull, are set to appeal this decision so I guess we’ll have to see how that ends up. 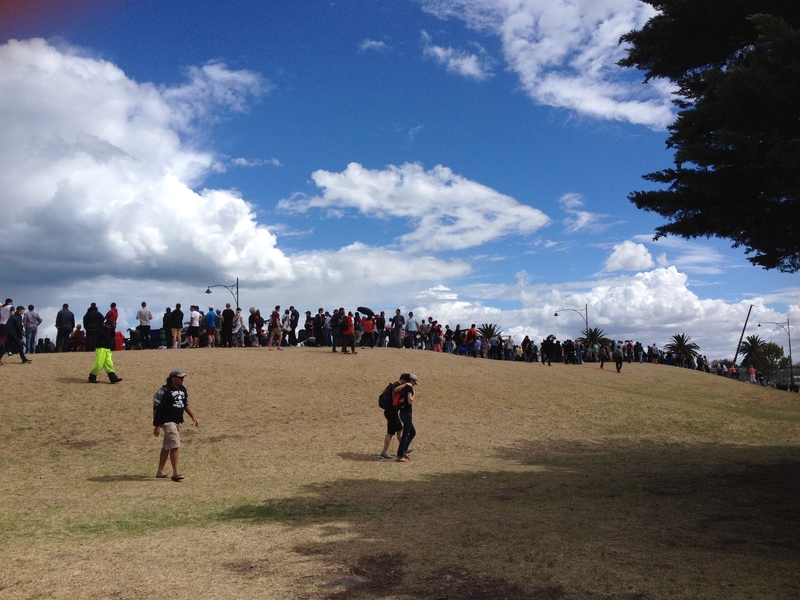 Once the race was over, everyone poured on to the track which was probably the highlight of the day for me. Flakes of burned rubber littered the road and people were picking up little souvenirs of the race and there were tyre marks all over the place. A short walk around a couple of the corners and we decided it was time to head out. I still don’t see myself as a fan of racing but I do suspect that I may find myself showing a little more interest than I have previously, simply because I have a better understanding of the sport. I’ve also come to appreciate why people do enjoy it, before the weekend I’d viewed Formula 1 as somewhat boring but that has turned out to be incredibly far from the truth.